Courtesy of Lauren Toyota and John Diemer for hot for food blog. 1. Sift flour, cocoa powder, and baking soda together in a large mixing bowl. Stir with a fork to combine well. 2. In a separate mixing bowl cream the vegan butter, sugar, non-dairy milk, and vanilla extract together with a hand mixer until fluffy and smooth. 3. Fold the wet ingredients into the dry ingredients and mix well with a wooden spoon or your hands. 4. Form a ball with the mixed dough and split that ball into 2 portions. 5. Place each portion into a piece of plastic wrap and rolling it out with your hands between the plastic, form a log approx. 2” wide. Try to flatten the ends as best as possible so you have a cylinder shape. Wrap up the 2 logs in the plastic wrap and tightly secure the ends. Refrigerate for 1-2 hours. You can make the Frosting during this time. 6. Remove the logs from the fridge and unwrap them. Using a sharp knife cut discs approx. ¼” thick. 7. Place the cookies on parchment lined baking sheets and bake for 5-6 mins in an oven preheated to 350ºF. 8. Allow cookies to cool completely before frosting. 2. Using a hand mixer beat the sugar with vegan butter, warm water, and peppermint oil until fluffy. 3. Break up your candy canes into smaller pieces and pulse them a couple of times in a coffee grinder. You want small pieces, but not completely pulverized to dust. Pour the candy cane pieces into a small bowl. 4. 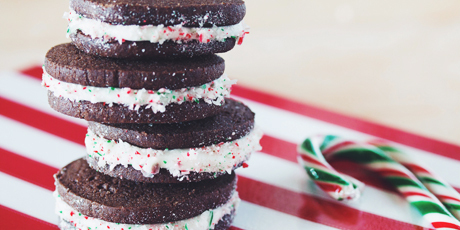 Spread 1-1 ½ tsp of mint frosting onto the bottom of a cookie with a small icing spatula. Place another cookie on top and lightly press so there is some frosting coming out the sides. 5. Then sprinkle crushed candy canes all along the sides of the sandwich, letting the pieces stick to the frosting and the excess fall back into the bowl. 6. You might find the frosting starting to dry a bit once you get through half the cookies. Just add a couple drops of water and stir it up again to keep it smooth.